Warren Earl Burger (September 17, 1907 – June 25, 1995) was Chief Justice of the United States from 1969 to 1986. Although Burger had conservative leanings, the U.S. Supreme Court delivered a variety of transformative and controversial decisions on abortion, capital punishment, religious establishment, and school desegregation during his tenure. No one has ever suggested that tax exemption has converted libraries, art galleries, or hospitals into arms of the state or employees "on the public payroll." There is no genuine nexus between tax exemption and establishment of religion. Walz v. Tax Commission, 397 U.S. 664, 675 (1970). 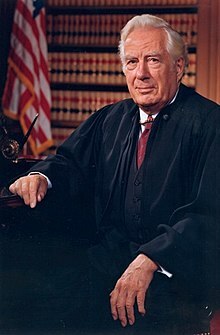 "Excerpts From Interview With Chief Justice Burger on Role of the Supreme Court", The New York Times (July 4, 1971). Writing for the Court, Griggs v. Duke Power Co., 401 U.S. 424, 432 (1971). The policeman on the beat or in the patrol car makes more decisions and exercises broader discretion affecting the daily lives of people every day and to a greater extent, in many respects, than a judge will ordinarily exercise in a week. Address to local and state police administrators up on their graduation from the FBI, reported in Frank J. Remington, Standards Relating to the Urban Police Function, American Bar Association: Advisory Committee on the Police Function, (1972), p. 2. No matter what coercive powers of enforcement governments may assert, the peoples in country after country in all ages have demonstrated that Man was meant to be free but that this ideal can be realized only under the rule of law. And this must be a rule that places restraints on individuals and on governments alike. This is a delicate, a fragile, balance to maintain. It is fragile because it is sustained only by an ideal that requires each person in society, by an exercise of free will, to accept and abide the restraints of a structure of laws. Reported in The Episcopalian: Volume 138 (1973), p. 12. Quoted in Newsweek, December 10, 1973, p. 75. The entire legal profession - lawyers, judges, law teachers - has become so mesmerized with the stimulation of the courtroom contest that we tend to forget that we ought to be healers - healers of conflicts. Doctors, in spite of astronomical medical costs, still retain a high degree of public confidence, because they are perceived as healers. Should lawyers not be healers? Healers, not warriors? Healers, not procurers? Healers, not hired guns? Annual address to the America Bar Association winter convention, Las Vegas (February 12, 1984). For some disputes, trials will be the only means, but for many claims, trial by adversarial contest must go the way of the ancient trial by battle and blood. Our trials are too costly, too painful, too destructive, too inefficient for a truly civilized people. Annual address to the America Bar Association winter convention, Los Vegas (February 12, 1984).